There's no doubt that human activities are having profound impacts on the natural environment. Over 75% of the earth's land area has now been transformed by human activity , which has triggered global biodiversity declines , and caused animal populations to decrease by 58% between 1970 and 2012 . Humans have changed the environment to such a degree that some have called for the designation of a new geological epoch named the Anthropocene, which is defined by the impacts of human activity on the planet . One group of animals affected by this is carnivores. Carnivores are some of the world's most important and admired animals, but they are also paradoxically some of the most imperilled . Around the world carnivores are experiencing rapid declines in their populations and ranges , but we still have much to learn about the complex relationship between humans and carnivores in modified environments. 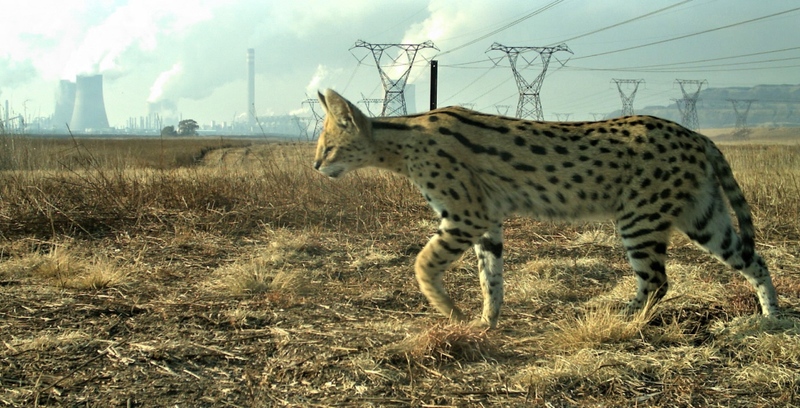 A serval is captured on a camera trap, walking in front of the Secunda petrochemical plant in South Africa. Daan Loock, CC-BY. In our new study, my colleagues and I estimated the population density (number of animals in a given area) of servals (Leptailurus serval), a medium-sized cat, at a heavily industrial site in South Africa. 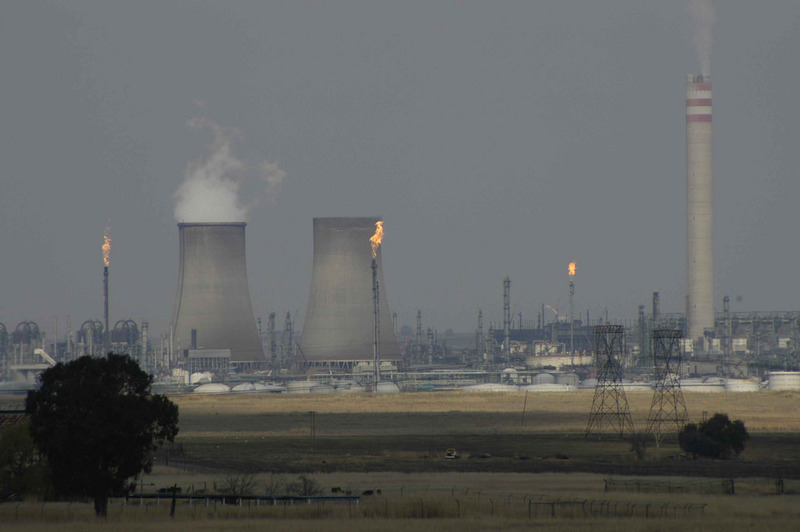 To achieve this we set up camera traps at Secunda, a petrochemical plant famed for being the largest point source of carbon on the planet . To our surprise, we found that Secunda supported 76 - 101 servals per 100 km², which is the highest density recorded for this species . Secunda - a heavily industrialised site in South Africa that supports a remarkably high density of serval. Horst Vogel, CC-BY. Why are these animals flourishing in this heavily modified environment? The water used for the industrial processes at the plant creates meadows in which rodents thrive, providing abundant food for servals. And for safety and security reasons the area around the plant is fenced and access is tightly controlled, which excludes species that could otherwise compete with servals, and also prevents persecution by humans . So while modification of habitats by humans has been devastating for many species, for others it can be beneficial in some cases. Species such as red foxes (Vulpes vulpes) and raccoons (Procyon lotor) that are able to adapt to urban areas are often very successful in these environments due to high food availability and little competition with larger predators . Although it's imperative that we conserve more intact ecosystems and curb our impacts on the environment, we should also remember that sometimes wildlife can flourish in unexpected places. We should take care not to overlook the potential conservation value of modified habitats. Even sites as heavily modified as Secunda could be incorporated into wildlife management plans, and may have a role to play in conserving threatened species. As argued by proponents of the growing Earth Optimism movement, we need to celebrate the positive stories in conservation rather than focussing too heavily on the negatives . We need silver linings. And we should celebrate unexpected success stories like the servals at Secunda. Loock, D.J.E., Williams, S.T., Emslie, K.W., Matthews, W.S., Swanepoel, L.H. (2018) High carnivore population density highlights the conservation value of industrialised sites. bioRxiv. doi: 10.1101/260729. 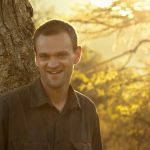 If you enjoyed this article or want to help Sam do more conservation work, please consider supporting his research by clicking here, commenting below, or sharing this article using the buttons in the sidebar. To find out more about Sam follow him on Twitter at @_sam_williams_, or check out his website at samualwilliams.com. Sam Williams is offering rewards for your donations!